Extra The Ticket is valide for 2 Days. On the Second Day till 5pm. Night tourism in albert Hall, Amber Fort is not covered under this. Info The Jantar Mantar monument in Jaipur, Rajasthan is a collection of nineteen architectural astronomical instruments, built by the Rajput king Sawai Jai Singh II, and completed in 1734 CE It features the world's largest stone sundial, Located near City Palace and Hawa Mahal of Jaipur, the monument features masonry, stone and brass instruments that were built using astronomy and instrument design principles of ancient Hindu Sanskrit texts. The instruments allow the observation of astronomical positions with the naked eye. The monument expresses architectural innovations, as well as the coming together of ideas from different religious and social beliefs in 18th-century India. The observatory is an example of the Ptolemaic positional astronomy which was shared by many civilizations. Info Hawa Mahal is a palace in Jaipur, India, so it is named because it was essentially a high screen wall built so the women of the royal household could observe street festivals while unseen from the outside. 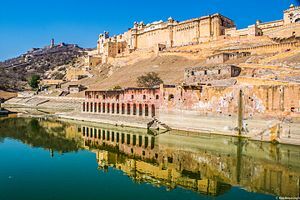 it is Constructed of red and pink sandstone, the palace sits on the edge of the City Palace, Jaipur, and extends to the zenana, or women's chambers. The structure was built in 1799 by Maharaja Sawai Pratap Singh. He was so intimidated and inspired by unique structure of Khetri Mahal and he built the grand and historical Hawa Mahal. It was designed by Lal Chand Ustad in the form of the crown of Krishna, the Hindu god. Its unique five-storey exterior is akin to the honeycomb of a beehive with its 953 small windows called jharokhas decorated with intricate latticework.The original intention of the lattice was to allow royal ladies to observe everyday life in the street below without being seen, since they had to obey strict "purdah" (face cover). The lattice also allows cool air from the Venturi effect (doctor breeze) through the intricate pattern, air conditioning the whole area during the high temperatures in summers. Many people see the hawa mahal from the street view and thought that it is front of the palace but in reality it is the back of that structure. Info Jaipur, inspite of being situated in the desert state Rajasthan has several natural and artificial gardens that add value to it as a tourist destination. Rulers of Jaipur city were fond of nature and they always give special emphasis on the construction and maintenance of gardens in the city. One of the prominent gardens is Sisodiya Rani Ka Bagh, largest of all in the city. 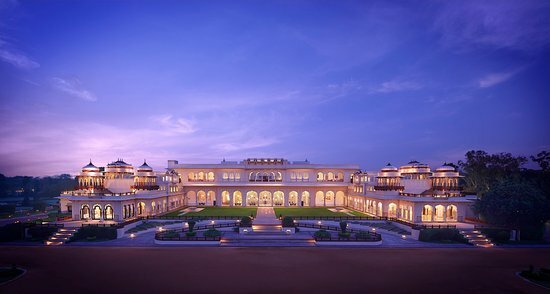 Sisodiya Rani Ka Bagh is located about 6 km from the city on Jaipur- Agra Highway. It was built by Raja Sawai Jai Singh in 1728 for his beautiful second queen Sisodiya Rani as a symbol of love. Extra Camera without tripod is allowed at the palace of Jaigarh, City Palace. Average Time To Spend 2-3 hrs. Extra City Palace, Jaipur, which includes the Chandra Mahal and Mubarak Mahal palaces and other buildings, is a palace complex in Jaipur, the capital of the Rajasthan state, India. See the composite private ticket price. Extra Jal Mahal is a palace in the middle of the Man Sagar Lake in Jaipur city, the capital of the state of Rajasthan, India. The palace and the lake around it were renovated and enlarged in the 18th century by Maharaja Jai Singh II of Amber. Average Time To Spend 1hrs. Extra Historic stepwell & rainwater catchment known for its picturesque symmetrical stairways.